Great Britain. The near future. Social, economic and environmental collapse. Righteous rebel forces clash with the remains of an unelected, fascistic military state. Meanwhile, in a secret laboratory, evil scientists in silver jumpsuits use sadistic methods to create the ultimate super-soldier. 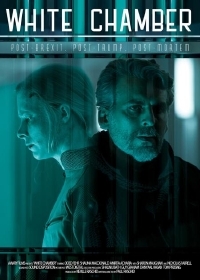 If this set-up (explained in gritty voiceover, naturally) sounds at all familiar, that's because it's been done to death a hundred times before, and better, but while writer/director Paul Raschid's sci-fi horror White Chamber may not be original, or even make much sense, nor even be 'good' or 'well-made', it is... well, it exists, and I'm here to write about it. The film opens with a woman waking up alone in a white chamber. She is interrogated by a disembodied voice which then activates some variously hideous torture devices (extreme heat and cold, electrical currents, acid sprays, etc) within said chamber in an attempt to extract information. "Your resolve is strong," says the voice. "The purpose of this chamber is to break that resolve." The woman is played by the talented actress Shauna Macdonald (The Descent, Filth), and upon zooming back five days into the past, we discover that she was in fact the head scientist in charge of the White Chamber, an observational prison pod designed to gauge the physical and mental limits of the scientific test subjects forced to participate in the government's super-soldier program. It would appear that Macdonald's Dr. Chrysler somehow ended up as the experiment herself, but how? The rebel leader, General Zakaryan (Oded Fehr), has recently been captured. He was to be Chrysler's next test subject. What could have happened within the space of five days that resulted in their roles being (oh so ironically) reversed? This set-up is actually fairly well-handled, unfolding like the opening of an episode of Black Mirror - and I suspect that this was the vibe Rashid was going for, all '70s-style paranoia, technophobia and frequent, shocking cruelty. When an idealistic new recruit, a young scientist named Ruth (Amrita Acharia), arrives to work at the secret lab, she becomes the audience's eyes and ears, our moral compass, as she discovers the terrible secrets and various power struggles at play within the sinister 'Principle Wing'. Ruth's moral outrage, and the other scientists' shrugging ambivalence, ostensibly invites us to ponder how far we might transgress our own ethical values in the face of destruction. What's a little torture if it helps to end the war? Surely the leader of the rebel army is expendable, right? There are some interesting ideas here to be sure, but sadly they are not expanded upon in any significant depth and ultimately the film's 'message' feels pretty flimsy. Similarly, and right from the get-go, the staging looks cheap. The film appears to have been shot in the atrium corridor of a mid-sized business conference centre, and despite being decorated with occasional flat-screen monitors and the odd bleeping console unit, when confronted with this particular 'secret lab', one can't help but think of airport hotels and open-plan offices. The filmmakers have opted for a 'clean and minimal' futureworld, but now that we really are living in the future, it just looks like your average place of work, only with additional test tubes. But the problem is not simply with the aesthetics of the film. The script is riddled with hard-worn cliches, from the ruthless, sociopathic head-scientist who questions her subordinates with thinly veiled threats of the, "I find your lack of faith disturbing," variety, to the embittered rebel leader suffering all kinds of painful indignities in the name of stoicism and pride ("Is that all you've got?! C'mon, hurt me!"). Experienced character actors Sharon Maughan and Nicholas Farrell do what they can with their roles as morally conflicted but ultimately loyal technicians, but the script repeatedly lets them down. There's even a moment where Farrell, as the browbeaten Dr. Edmund, inexplicably decides to quit smoking cigarettes, just so that we know he's troubled, or tired or something. Acharia's Ruth is a one-note character, existing solely to appear shocked, question her colleagues, and then ultimately decide if it's worth fighting the system. It's not a bad performance, but again there's so little depth or sense of character history - we feel as though we're watching somebody going through the motions. In many respects Dr. Chrysler ought to have been the saving grace of this film. Had she been let off the leash, I suspect Macdonald could have done fine work chewing the scenery to pieces as a half-mad military scientist hell-bent on revenge, but she plays the role as an ice-queen instead, clipped and formal. Insane, yes, but keeping herself in check until an abrupt showdown reveals the rage underneath her calm exterior. I don't know about you, but I prefer my fascist, pain-obsessed military scientists to be bonkers right from the get-go. To White Chamber's credit, it moves fast and is never truly boring. The sets are dull and flatly lit, the characters are uniformly two-dimensional, their dialogue delivered dutifully by actors who deserve better, and the story is predictable, despite relying on several largely incoherent and faintly ludicrous plot twists (identical twins feature in this equation at one point, seriously), but I suppose I was happy enough to see where it went. This isn't a horrible film, but that is not a recommendation. Paul Raschid was born in 1993, so he's 25 years-old at this point. If this what he can do with a small budget at age 25, then you know he's going to do better things in the future. Keep at it!